Will the human head transplant successfully done? Early last year, the Italian neurologist, Sergio Canavero shocked the world when he announced it would conduct the first human head transplant in the world. The operation is scheduled in December 2017, with volunteers Valery Spiridonov, a Russian computer scientist. So, how the preparation development of the transplant surgery? Canavero had scheduled to announce more details about this controversial operation in September. Meanwhile, Spiridonov, willing to speak about the operation to be lived. "I continue to dialogue with Canavero, we exchanged information, and as far as I know, he was preparing an announcement about this operation this September," he said. 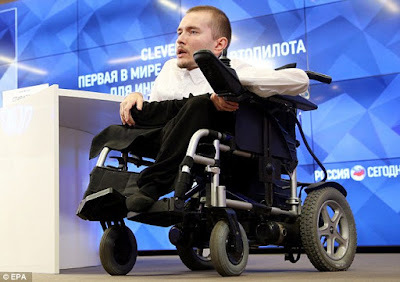 Spiridonov suffering a rare motor neuron disease known as Werdnig-Hoffmann disease, also called spinal muscular atrophy which causes the sufferer experienced difficulty of moving, breathing and swallowing. Most people with this disease die in their first years, but Spriridonov included in 10 percent of people are able to survive until adulthood. He admitted that his family fully supports his decision to become the first man to undergo the operation and said, "If you want something accomplished, you have to participate in it." "I fully understand the risk of the operation. We could not even imagine the worst thing that will happen. I'm afraid I can not live long enough to see the operation was carried out on others," he said. However, Spiridonov want to try a chance to have a new body before his disease kills him. Spiridonov who is also a scientist, recently presented the autopilot system on a wheelchair at a conference in Moscow. The project, called Clever Chair was developed to improve the quality of life of people with disabilities. He said that, unlike the head of transplant surgery to be lived, the Chair Clever project is intended to be used by a wide audience. "I want to help as many people with technologies that do not cause doubt and debate," he said. However Spiridonov hoped, at least his project and Canavero can be complementary. Details of the operation has not been announced, but Canavero have outlined how the operation is run. Patients will receive a healthy donor body coming from brain dead patients. The patient's head will be cooled to a temperature of minus 15 degrees Celsius. After that, the patient's head and donor simultaneously be separated from the spinal cord using ultra sharp blades. The patient's head is then connected to the donor's body using polyethylene glycol compounds to connect the end of the spinal cord. Patients will be in a coma for about a month to prevent any movement, while the spine will be stimulated with electrodes to strengthen the neural connections. Canavero predict that the patients will be able to walk within a year after surgery. Although the plan at first glance seem ready and mature, but still there is the ethical implications that must be faced by Canavero and his team. In an interview with Xinhua news agency, Alberto Delitala, president of the Italian Society of Neurosurgery, said, "Our position is very clear, the central theme of the scientific method states that all new techniques must be based on a test experiment that has been submitted to the international scientific community before being applied to human. While Canavero never managed to prove that he succeeded to transplant the head of the animal." "If Canavero really have found a breakthrough technique in reconnecting the spinal cord, why he did not apply to people with spinal cord injuries before transplanting the head? In my opinion, the proposal of Canavero on the human head transplants is fantasy that is not possible at this time," he continued.